This month there are so many exciting launches from new collections to Christma gifting. I'm so happy that Christmas stuff has already started to appear online as I can't get enough. I have picked out some of my favourite launches to share with you this month. Feel Unique Advent Calendar £75 - Valued at over £250 and includes brands such as EOS, Sleek, Nails Inc, Charlotte Tilbury and more. 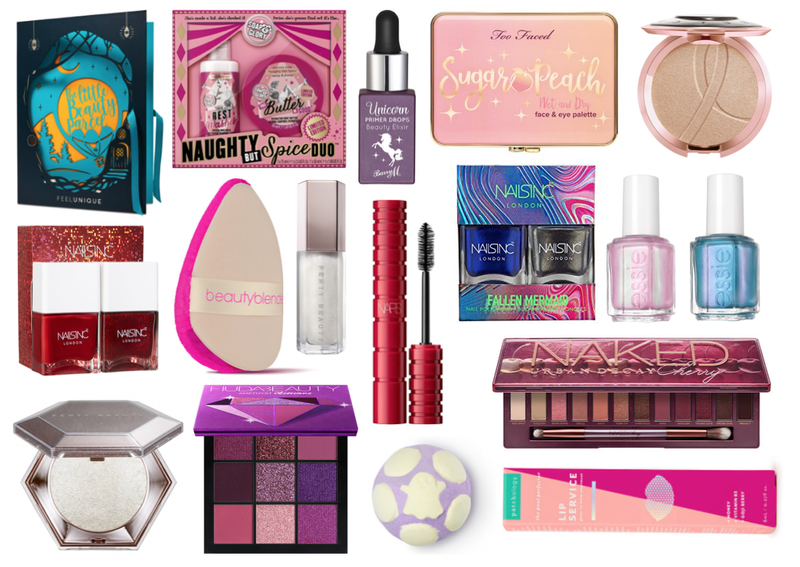 Soap & Glory Christmas Range 2018 - There are so many gift sets available this year that I can't wait o get my hands on! The advent calendar has made a comeback as well. Barry M Unicorn Priming Drops £7.99 - The perfect product to prep your skin. Too Faced Sugar Peach Palette £34 - A four pan palette that can be used as highlighters or eyeshadows. Becca Limited Edition Breast Cancer Awareness Highlighter £30 - In the shade Opal. Nails Inc Less Bitter More Glitter Duo £15 - A gorgeous red nail polish duo, perfect for the holiday season. Beautyblender Power Pocket Puff £13 - A double-duty beauty tool for applying makeup. Fenty Beauty Diamond Gloss & Highlighter - Two brand new products from Fenty, a new shade of the Gloss Bomb and a brand new formulation of highlighter. Huda Beauty Palettes £25 - Brand new colour themed palettes. NARS Climax Mascara £21 - Has a flexible, lightweight formula. Nails Inc Fallen Mermaid Duo £15 - Another brand new nail polish duo and includes a stunning blue that I can't wait to get my hands on this. Essie Winter Collection 2018 £7.99 each - Six new shades, three of them I have to have! I love the reflective finishes. Lush Halloween & Christmas Collections - Including so many different individual products and gift sets. Urban Decay Naked Cherry Collection - This collection includes an eyeshadow palette, lipsticks and a setting spray.